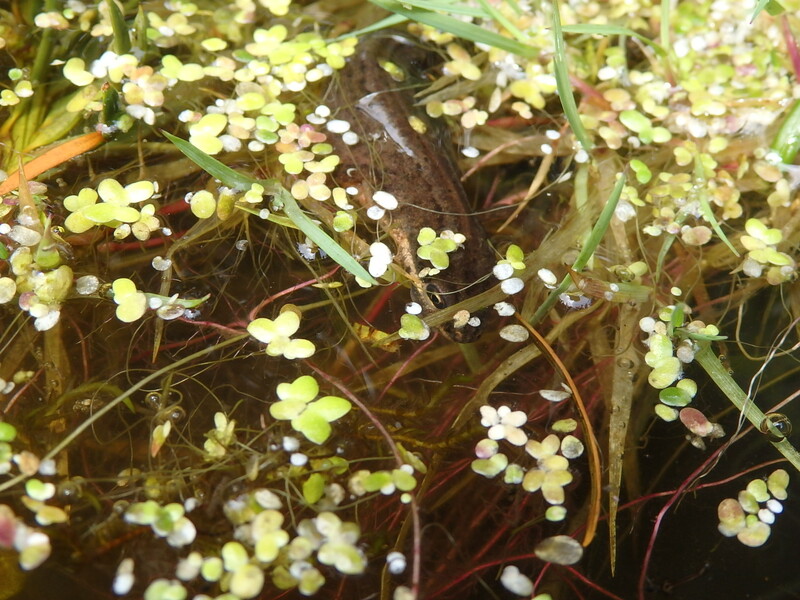 Having spent some time yesterday communing with a frog I set out this morning to do the same with a newt. Newts are a great deal more shy than a frog. A frog is happy to put its head up out of the water and sit there quietly taking in the sun and, so long as you don’t make a loud noise, allowing itself to be photographed. Newts lurk under the water skirting beneath leaves and the green tangle of weeds on the surface and by the time you see one it has gone with a flash of its tail. So some time had to be spent doing nothing but crouching by the side of the pond waiting for one of them do something. It is surprising how much movement there can be in the slow still water of a pond. The slowest movement is the crawl of a water snail over and under the weeds on the surface and then there is a bend in the water as a fish moves underneath and the plop of a newt or frog as they elude the watcher again. Eventually a newt held still near the surface and I got it. Then we went out for some late lunch in Liverpool walking past the old Cains building and bemoaning the closure of a brewery.